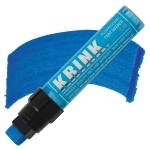 Filled with waterbased ink that is xylene-free, solvent-free, and odor-free. The fluorescent colors glow in black light environments, and the extra-broad, valve-action chisel tip is great for creating thin or thick bands of vivid color, particularly large calligraphy work. Handmade in the USA.